Does low price = low quality? At Metro Textiles with Kashi - I blurred the ID # because I might need to buy more! If you've been to many stores in the garment district like I have, I'm sure you have noticed the wide variety of prices you can pay for fabrics and notions. I have profiled so many stores on this site, ranging from the very low priced, to the high priced, and the difference(s) may not always be effectively conveyed here in the blog. So, what's the difference? There are many. Location, location, location. Well, real estate is a big one. If a vendor has a great space in a great spot for foot traffic, they have to pay significantly more in rent (unless, by some miracle, they made a great deal on a very long lease long ago), and maintain a great environment for shopping. 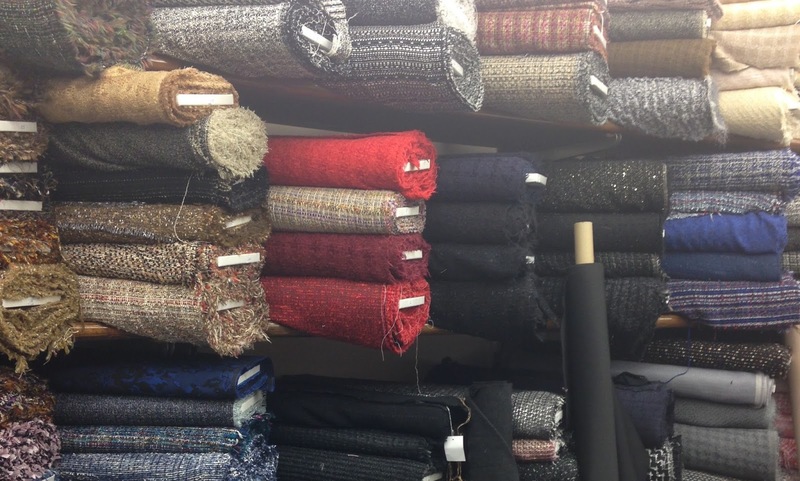 It is a bonus if they also offer a great quality, well curated selection of fabrics, in an easily navigable store. See NY Elegant as an example. Unusual location. Maybe you have to jump in an elevator, climb a staircase, or visit streets outside of the district to find them, but it is worth every step... See Manhattan Wardrobe Supply , Leather, Suede, Skins, and Fabrics & Fabrics as examples. Relationships is another big one. Businesses that have been around for a long time, and have great relationships with vendors get great fabric who have a great understanding of quality. They may be able to offer great quality at a better price than you would otherwise pay, but that quality if invisible to you if you don't have your own fabric education. See B&J and Rosen & Chadick as examples. Knowledge/education. If you want something that washes/launders well, recovers beautifully, doesn't fade, and lasts a long time, there are some great vendors who can show you which fabrics they know to perform well. You won't know this until you try it yourself. I like to cut two squares of the washable fabrics I buy and send one though the wash with my regular laundry in the same color family. I then compare the size and look of the two squares to determine how I will care for the fabric after using it. This is especially important when combining different fabrics in one garment/project. See Rosen & Chadick and Sposabella as examples. Exclusivity. When a fabric store offers exclusive fabrics other vendors can't obtain, you will pay what the store needs to charge in order to continue doing business. That's just an economic fact. See Elliot Berman and Mendel Goldberg and as examples. Specialty goods. Some fabric vendors offer a narrower range of fabric types, but they REALLY know what they know. See Graylines Linen, Spandex House, Mokuba, Buttonology and C&J (and so many more!) as examples. "Closeouts" or just the last of it... Some fabric vendors are buying "what's left" from their suppliers, probably at a wonderful price, which they then pass on to you. But if you want to reorder some of the same fabric in the future, you may find yourself unable to do so. If that is the case, buy more than you need, and cut (if you can't get to sewing yet) before it's too late to get more, if needed. If you wait too long... well, that's the price you pay! See Metro Textiles and Paron Fabrics as examples. Fantastic Quality. Some stores just have better fabric than you can otherwise find. See Mendel Goldberg and Elliott Berman as examples. Questionable quality. Some fabric vendors simply sell poor quality goods. This is very easy to learn the hard way. I simply don't feature those vendors on this site, but I make a point of not insulting anyone here, either. Keep in mind that some vendors offerings don't really speak to me, so I don't feature some whose offerings I personally don't understand/appreciate, but really, it may or may not not be a quality issue. So, how do you know what a fabric store is all about? Ask them! Most will be happy to tell you what kind of business they are running. Need a map to help you navigate the district? You can buy one, here. But 'tis only next door! Maybe you'll like this one better? Wait, the door has changed! I stepped in, timidly asking "Is this Lou Lou?" And yes, it is. No sign above the door yet. After a flood and collapsed ceiling forced them to move out of the store next door, the store has been neatly moved into the adjoining well lit, cozy space, happily accepting customers. The awning? "I think it is is old construction. We can't take it down." a voice said. I looked around at the beautiful buttons displayed throughout the store. The wife of the owner quietly welcomed me, happy to show me some of her husband's best work. 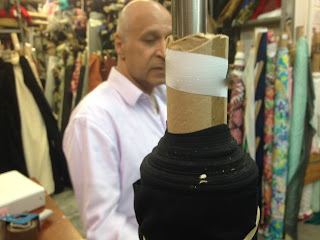 After lots of "shop talk" and discussion about what makes a button shop like theirs possible in the garment district (for 20 years now), she gently added, "We custom make buttons here. That's the difference. We sell to Broadway shows and Opera Houses and designers, and people who want something unique and individual." Note: In the time I spent there, another person entered, asking... "Wait, is this Lou Lou? Oh, thank God! I thought you were gone!" The most recent post written about Lou Lou was posted in 2008 by Meg, the former owner of this blog. If you want to make a Chanel-inspired jacket, this is the place! A New Yorker all my life, I had never actually ventured all the way down to Hester Street to see Mendel Goldberg Fabrics for myself. Yes, I've heard it is a great place, highly praised by such quality sewing professionals as Susan Khalje and Claire Shaeffer, but, until now, I simply hadn't explored why. While inside this delightful, quiet store, I had a wonderful conversation with Alice, the host, great-granddaughter of Mendel Goldberg, and personality of the shop, who greeted me warmly and explained what sets her family business apart from the garment district fabric stores. In business since 1890, this small boutique fabric shop is a carefully and beautifully curated collection of exquisite fabrics hand selected by Alice (Goldberg) from the finest mills in Europe. A New York Times article written about the store gives a beautiful impression of its history. I saw wool guipure, brocades to die for, and colors and prints that are absolutely swoon-worthy. No kidding. Pictures of the fabrics don't do them justice. Visit, see, and touch to learn for yourself! They do not sell notions or trims of any kind, so plan accordingly, as you will only be shopping for your "star of the show" fabric here, and will need to purchase your other supplies elsewhere. I was fortunate enough to accidentally eavesdrop on an appointment with a shopper (yes, they do allow appointments) during my visit, and was truly impressed by the level of customer service the client received. Advice like, "I would not suggest that fabric for you. ", and "You'll need more yardage to create that." was offered with a firm and patient tone, and she even went the extra mile to give more suggestions, which included products inspired by the client's requests during the appointment, which were then happily retrieved from the downstairs inventory. Where they win: Quality, Curation of goods, Shipping options and Customer Service. If you are the right type of client for this shop, this is a unique and fabulous resource. I must have touched just about everything they have to offer during my visit, and was truly thrilled with the experience. 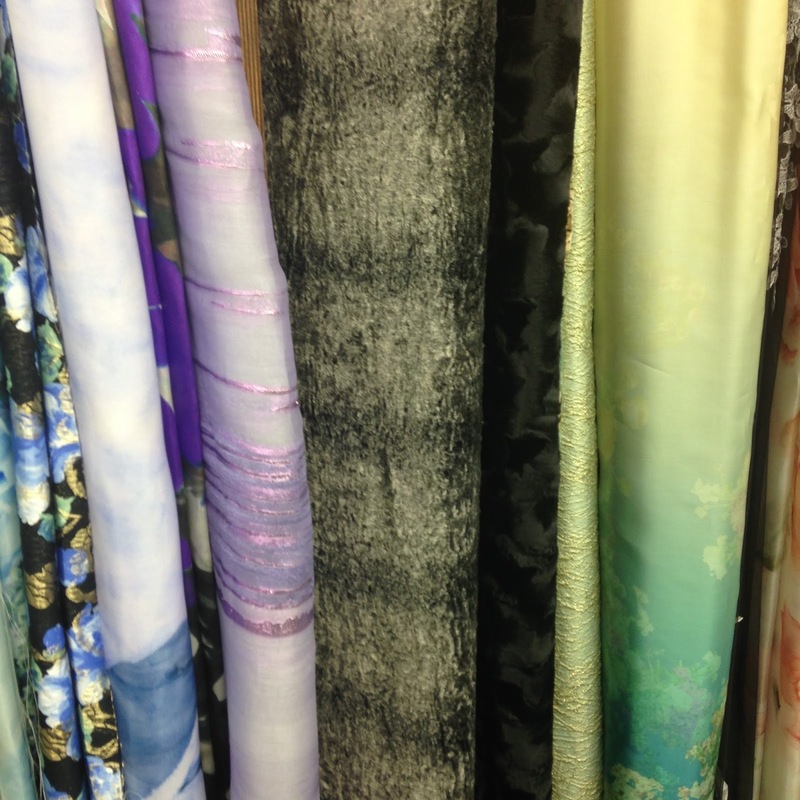 This is a place to go for fabric to create special-occasion wear or high-end pieces. Before visiting, be sure to note the prices of the fabrics on the website, because that is the ballpark range you should be expecting to see when shopping there. Worth noting - this business has been in the same location since 1890. That means, in addition to all of the changes our city has faced since then, it has survived BOTH 9/11 and Hurricane Sandy. Now, that's resilience! While heading east on 40th Street yesterday, taking a walking route from the east side (something I rarely do, but I was early for an appointment), I ambled past a glass-windowed, busy room full of fashion students working at industrial machines. This has become a rare sight in the district now, since so few schools are actually teaching the real hands-on design work. "What is this?" I thought. Turns out, I've seen the name on the building before, but never gave it much of a thought, since I really only consider the industry powerhouses (FIT and Parsons) whose names are widely recognized in New York City and beyond. The Wood-Tobé Coburn School. I walked around to the main entrance to take a look at their brochure. A polite person at the main desk handed me a mailing card that one can mail to them to "ask for more information". "We also have a website." She smiled, indicating the end of the conversation, and I made my exit. Okay, so marketing is not their strong suit. Maybe I'm just old-fashioned? I took a look at the catalog offered on the site, as well as the tuition and job placement information. It seems that this school is more of a trade school, cutting straight to an accelerated program with the goal of landing a job. While I don't have enough information to actually ENDORSE the school, one might wonder why I am even mentioning it here... I noticed that the students I saw in my brief look through the window looked quite young, professional, and serious. This private, for-profit school seems to straddle a few different industries, fashion being among them, and, judging from the information I read on the internet, the reviews are mixed. Largely career-focused, the school seems to be aimed at students who are seeking a foothold on a professional path, rather than an exploration of a specific discipline. Do any of you readers have experience with this school? Below is a post from my old blog, written in July 2011. Sometimes, despite your best intentions, things can go horribly wrong. Failed relationships, disappointments... make you wanna "make lemonade". That lemonade isn't always as sweet as you'd hoped. On that particularly dismal trip to Hot-As-Heck, NC in the summer when I was 16, my mom distracted "my grandmother" (my own awkward name for her, since it never rolled off my tongue to call her "Grandma", or anything like that.) outside for a bit, my Dad pushed aside a large dresser to reveal a door in the front room that lead deeper into the house. Behind the dresser, in neatly appointed rooms covered by a thick layer of dust, lay the year 1965 or so. Furniture in conversational positions, and a lovely baby grand piano, showing signs that a real life had been lived here. Organized and bright, these lonely rooms had been untouched for at least a decade, I suspected. And the "kid's" rooms (my Dad and his brother) were just as they left them even longer ago. At times, my grandmother talked about her "kids" as if they were still boys, and her husband (my grandfather) who had died before I was born, as if he were still alive. My Dad showed me the rooms, whispering quietly, unemotionally, and factually about what each room represented for him. We tiptoed out, put the dresser back as it was, and pretended to be sitting quietly when she came back in. Wiped out after a dressmaking project that went wrong, I decided to work out my dissapointment with a personal project. Because I had used an expensive fabric from my personal stash (a luscious, black double silk organdy) as a lining to help "save" a dress that ultimately didn't work for a client, I decided to reclaim some of that fabric for a new dress, which I would name "Things we lost in the fire". My obsession with flame motifs led me to buy a lovely cotton emblazoned with a firey mix of reds and oranges, and apply it to a summer dress. Set against a smooth, jet-black cotton, I sketched and imagined until a creative frenzy sent me to the dress form to messily drape the design. I adjusted the pattern to my shape, cut the dress pieces, assembled the dress, and was pleased. That is, until I put it on. Somehow, I had created what looked like a grandma's nightgown with flames. Hot flashes? Ode to menopause? Not what I was going for. Knowing I would never wear it, I resolved to find the version of this idea that I would/could wear. Okay, the silk organdy has no place on this dress, either. I wanted to place it as a bottom border, sorta giving the illusion that the fabric had been singed as the flames traveled up the dress. Okay, so I could see it in my head... but on the body? Just Terrible. All of that to get to this. Black skirt, to be worn with a black tank and my favorite red wedge sandals. I still wear that skirt happily, four years later, on the HOTTEST days of the summer. You hate originality. You are not a fan of looking any different, more creative, more fitted, or polished than anyone else. You just want to blend in, and you want the same for your accessories and home decor items. You have NO spare time at all. Hey, know that 20 minutes you spent staring into space/glazing over/Facebook posting/contemplating the laundry? Don't use that. That time doesn't count. There have been novelists who have written important work in their "spare" time, or by using stream of consciousness techniques, but seriously, they must have been superheroes, since we all know that isn't even possible. Right? You can't find any stores that sell fabric you like or can afford in the garment district. There are so many stores, and darn it, you've explored them all, which took WEEKS, actually. All for naught, because... You loved NOTHING. You have no new ideas, no old ideas, and NOTHING inspires you. You feel NO satisfaction when you make something yourself. You'd rather long for things you can't have. Maybe you could make them... but who feels like trying? Really don't... Have I convinced you? On three separate days last week, I took Speakeasy participants to many different locations, for many different reasons. Our stops included about 25 different locations in all, for more reasons than I can explain in just one blog post (it would be HOURS of reading), and believe me, the district still has many treasures to offer beyond those specific trips, and additional surprises to inspire any of you as well. Double georgette in great colors? Botani. Yes, really! Silk in great (unexpected) colors? Botani! And what was learned? How to mark your buttonholes for Jonathan Embroidery, how to get custom fabric flowers made, how to cut your fabric correctly for pleating, how to access FIT's amazing resources, how to fabric shop effectively, where to find the most stellar array of boucles, how not to get taken advantage of by fabric vendors, how to get snaps, buttons, grommets installed, where to get the best muslin and fusibles, where to find large rolls of carbon paper, where to find the best assortment of elastic for various uses, where to find some great (and economical!) 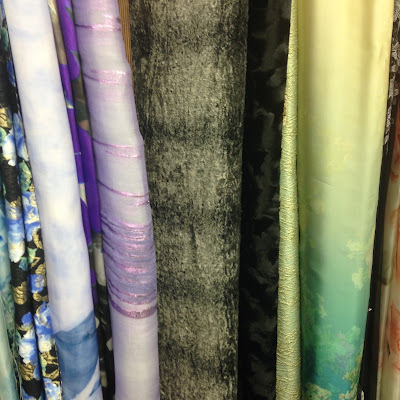 silk solids, great notions suppliers, and lots of eye candy. Yes, it was work, but as always, it was also fun! As part of one of this week's Speakeasy excursions, we saw this lovely exhibit in the Special Collections Gallery at the FIT museum. If you read the description below, it is truly all you need to know to appreciate these wild pieces. My own pictures are below the description (photography is allowed). -FIT museum's description of this exhibit, currently in the special exhibitions gallery. Related: There will be a FREE two-day symposium on October 22-23, examining the links between Susanne Bartsch's 30 year exploration of sartorial self-expression and its influence on the global fashion scene. The exhibit will remain in place until December 5, 2015. It is really quite a creative exploration for people who appreciate theatricality in fashion. If this appeals to you, be sure to check it out! Meanwhile, there's an exhibit upstairs in the museum as well. See the Global Fashion exhibit while you're there!